I have touched on blogging several times here at Work at Home Adventures and I try to keep active with one of my several other blogs, TheBloggingNerd.com where I give advice and review tools for bloggers. But it’s time we go beyond snippets of information here and there. It’s time to dig deep, start at Zero and baby step forward. Coming next month (April 2nd) you and I will begin working together. I will be publishing a blogging series here on WAHA. We will start at step one…the thinking stage. Then we will move through the building, advertising and monetizing steps!! Then to wrap it all up- I will host a WebEx Meeting Online and will be inviting several successful bloggers to join in the fun. We will be available to answer your questions and tie up any loose ends. Need your questions answered NOW? Ask WAHQuestions and get an answer right away! 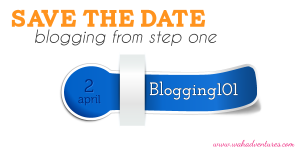 I look forward to working with you and walking you through the basic Blogging 101! I am excited to see how your blog turns out. I think you will have a lot of fun with it! Sounds like fun. The thinking stage is probably the most important. I’ve found if I start a site and haven’t really thought about the subject behind my blog thoroughly, I usually end up abandoning it, for lack of interest. Yes I agree Lisa!! If you cant immediately think of 10 different things you would write on covering one subject…then don’t bother. You don’t want to struggle to come up with content. It should be flowing out of you!! Oh Miranda. You have taught me so much already! Thank you! How generous of you to share your success on blogging!! You will be more successful because of you do!